According to a China Mobile road map, the world's largest carrier expects to launch the Apple iPhone 7c in April. The latest rumored specs include a 4-inch display carrying a resolution of 640 x 1136. This would work out to a pixel density of 325ppi. The Apple A9 chipset will be under the hood, along with 2GB of RAM. The early word is that the handset will feature Touch ID, an 8MP rear camera, and come with a metallic build. Color choices will be Gold, Silver and Black. The device will cost more than 3000 Chinese Yuan ($463 USD). While earlier rumors have stated that the 4-inch iPhone would be given the Apple iPhone 6c name, the road map apparently calls the unit the iPhone 7c. It would seem strange for Apple to debut a newly designed iPhone series with a smaller-screened version of its iconic smartphone. Regardless of what the name of the phone will be, let's just say that China Mobile plans on launching a 4-inch iPhone in April. Other phones listed on the road map include the Samsung Galaxy S7, slated for a March release. This phone is also listed with a price above 3000 Yuan. 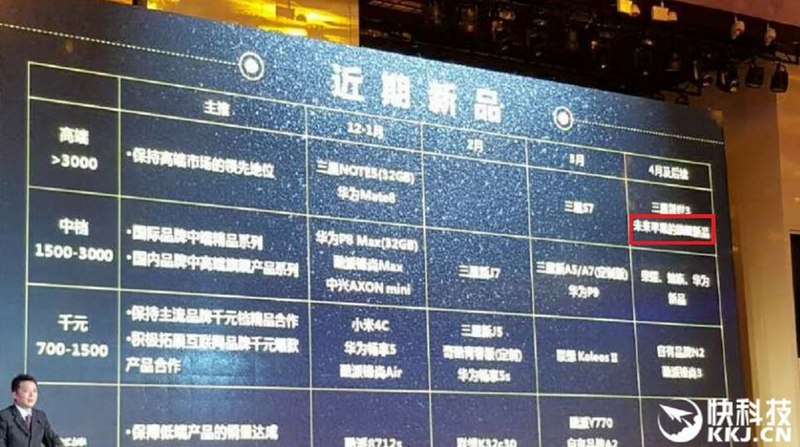 The Samsung Galaxy A5 (2016) and Samsung Galaxy A7 (2016) are both scheduled to be released via China Mobile in March. Pricing for the pair is between 1500 and 3000 Chinese Yuan ($231.50 USD-$463 USD). The Samsung Galaxy S7 will most likely be unveiled at Samsung's next Unpacked event, which will take place on the eve of the MWC keynote speech scheduled for February 22nd. I was about to point that out. I thought it should be 6c. Will Apple launch midrange iPhone 7c before the flagship iPhone 7? Quite strange! Of all the 5S's I've used, it runs flawlessly on iOS 9. Even the 5 handles iOS 9 just fine. iOS 9 is actually lighter than iOS 8, quite a lot after 9.2 i would say. Should just get rid of the number system altogether. iPhone Mini, iPhone, iPhone Pro.